Four weeks from now and we will witness the PBB Big Night wherein the nine teen housemates will compete to be included on the Big 4 of Pinoy Big Brother Teen Edition 4. 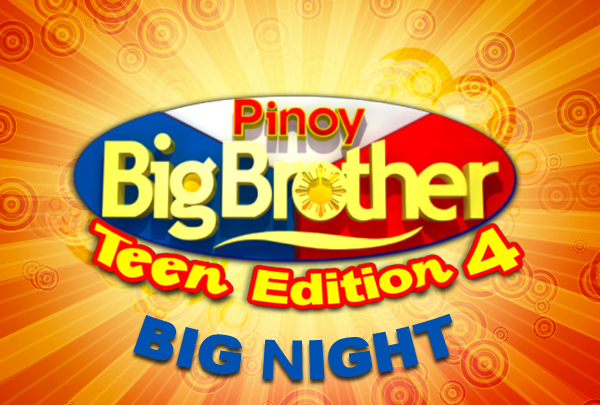 One of the Big 4 will be announce as the next "Teen Big Winner" of this edition on July 7, 2012. For the 4th Big Placer, she/he will get P200,000 in cash plus appliances and gadgets. And on the 3rd Big Placer, she/he will get P300,000 in cash plus appliances and gadgets. Then to the 2nd Big Placer she/he will get P500,000 in cash plus appliances and gadgets. Lastly, the "Teen Big Winner" will get P1,000,000 plus Sony gadgets and a trip for 4 to abroad. Meanwhile, the announcement also revealed that there will be 4 Big Surprises to happen before the PBB Teen Edition Season 4 Big Night. So if you want to know more about that surprises, please bookmark this page for the latest updates on Pinoy Big Brother (PBB) Teen Edition 4. Comments or suggestions about "Pinoy Big Brother (PBB) Teen Edition 4 Big Night" is important to us, you may share it by using the comment box below.